Instant Expansion: USB-C Hub with Type-C PD charging port, HDMI Port, 3 x USB 3.0 Ports, 3.0 SDXC/Micro SD Memory Card Reader. Power Delivery: Charging your MacBook Pro or other type-C port devices while connecting multiple peripherals . 4K Video Adapter: Mirror or extend your screen with USB C Hub HDMI port and directly stream 4K UHD or Full HD 1080p video to HDTV, monitor or projector. 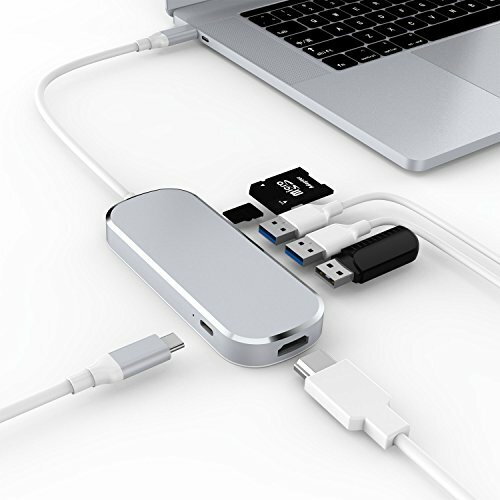 USB 3.0 Ports: Allow you to connect keyboard, mouse, thumb drive to MacBook Pro or other Type-C devices, and access files from SD Card Reader. Mac-Style Design: aluminum alloy exterior, ionized finish, EMI protection to prevent interfere with wireless devices. Support：MacBook Pro，Google Chrommebook，Hue Wei Matebook ，Galaxy S8 ，HUAWEI Mate 10 and with Type-C 3.1port. Support system：MAC OS，Windows，Android with Type-C 3.1 port. If you have any questions about this product by Coling, contact us by completing and submitting the form below. If you are looking for a specif part number, please include it with your message.